Hi, Paper Players friends! What an abundance of springtime cheer you gave our colors this week! I was so glad to see that many of you came to love these colors even though they might have seemed challenging at first. I truly could have picked several beauties as my winner this week! Before we get to the Headliner, however, let's have a look at the Design Team's selections for A Cut Above. 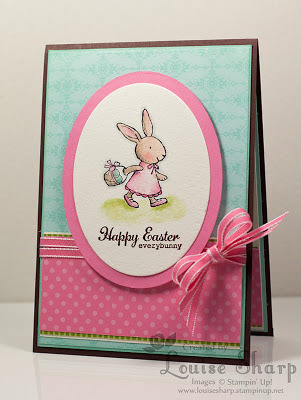 Louise stole my heart with her sweet little bunny card! The crisp, clean lines attracted my attention but her amazing watercoloring pushed it right over the top. She really highlighted how pretty these colors are together by using all of them to great effect in her main image. The double ribbon bow is so playful and the oval Easter egg shape is perfect for this beautiful springtime creation. Congratulations Louise, you're my choice for this week's Headliner! Please come back tomorrow for a fabulous Clean-and-Simple challenge from our amazing Ann!!! Thanks Jaydee for choosing my card! And congrats to everyone else! Justin, thank you for choosing my card this week! I so very much enjoyed this color challenge and always enjoy playing with The Paper Players. Congratulations to all the selected Cut Above's and to Nance's Headliner...that bunny stole my heart as well. Thanks again, Justin and look forward to tomorrow's Clean and Simple! Oh my! Really a 'Headliner'!? I am just so excited. Thank you Nance for choosing my card, I am very humbled as there were so many amamzing creations - my heart is skipping! Congratulations to all the Cut Above's - I love them all. Thanks so much, Amy, for choosing my card as one of the favorites!! I loved this color combo! !